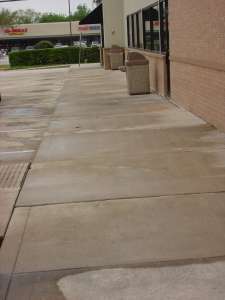 Our Gum B Gone service makes sidewalks and outdoor surfaces look like new again, utilizing a state-of-the-art process that removes not only the gum, but all residue as well, leaving the surface restored with no trace of the chewing gum or stain. Gum B Gone’s unique high-temperature process cleans and sanitizes without the use of chemicals, so it’s safe for indoor applications, including food preparation areas. Our thermal sanitizing system kills germs, bacteria, spores, and viruses on contact. It’s environmentally safe and conforms to USDA and EPA standards. In addition to gum removal, the Gum B Gone system is effective in treating grease, oil, mold, mildew, and even most graffiti stains. Call us today at (832) 477-6233 for more information.